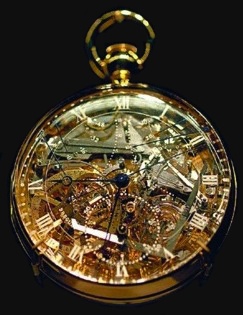 During the different time periods of development in watchmaking several books have been written about techniques of building watches or clocks, regulating them or just keeping them running properly. Moreover, much written correspondence beween watchmakers and clients was produced. Unfortunataly most of it has been lost. We would like to show several important or interesting pieces of these works which are in private collections, comprising books, letters and also just notes from historically important people who have somehow a link to watchmaking. This book, written by Ferdinand Berthoud, explaining how to regulate, adjust and keep running watches and clocks properly, shows the gilt coat of arms of the Empress Maria-Theresia of Austria (1717 – 1780), mother of Marie-Antoinette, on the front and back cover. It was part of the imperial library in Vienna until its transfer to a private collection in Britanny, France towards the middle of the 19th century, where it was kept by an aristrocratic family until it was passed on to a Swiss private collection. The book is written in French in a very understandable way and describes what criteria are needed to buy a good watch from a reliable watchmaker. Watch distributors being not knowledgeable enough to sell good watches and also some sources for specific material used for watchmaking are mentioned. A whole section is dedicated to the explanation of the equation of time and why a watch or clock can not automatically show the ‘real’ solar time, unless it has the equation of time function (very much studied by Berthoud). At the end of the book one can find tables for the equation of time and four engravings to fold out, showing several mechanical drawings of watch -and clock movements and some of their parts. Note hand-written and signed by Talleyrand ‘le père de Talleyrand’ (father Talleyrand) on a piece of paper which appears to be an old letter (remnants of text behind). The note states, that an important personality involved in the development of institutions of higher education in Paris should be followed and watched. This person advanced projects which were against Talleyrand’s own opinion on how the higher education should be organised. A rare, early handwritten note, which shows how Talleyrand wanted to be informed about everything happening around him. There are many signed pieces by him, especially forms or letters written by others in connection with his status as foreign minister. Handwritten text by himself is quite rare. Talleyrand was born into a leading aristocratic family in Paris. 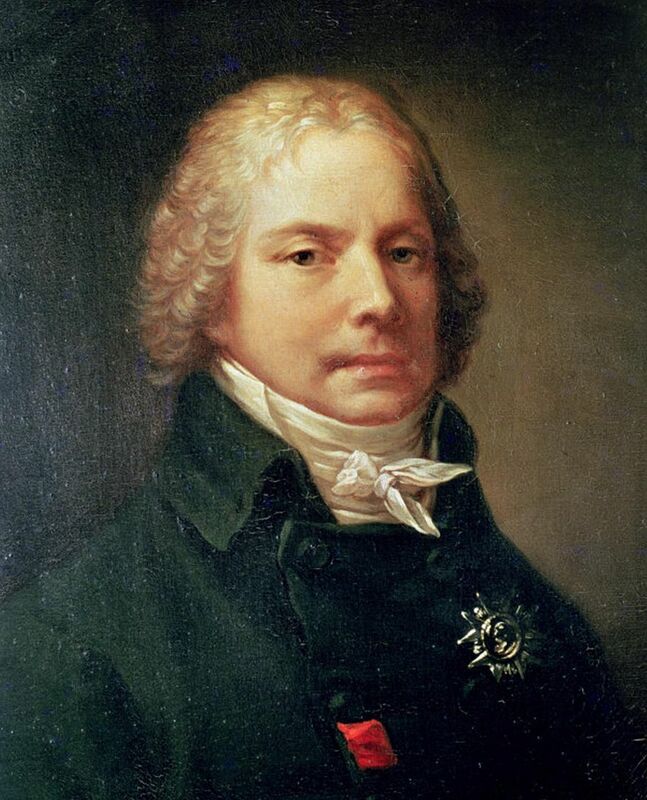 He was prince de Bénévent, then prince de Talleyrand and was a French diplomat. He was ordained a priest in 1779, when he was 25. 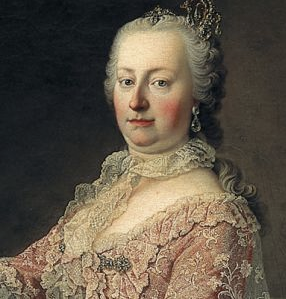 Later he worked successfully at the highest level (usually as foreign minister) for the regime of Louis XVI, through several governments of the French Revolution and then for Napoleon I, Louis XVIII, Charles X and Louis – Philippe. Most of them distrusted Talleyrand but, like Napoleon, found him indispensable. The name “Talleyrand” has become a synonym for crafty, cynical diplomacy. He was Napoleon’s chief diplomatic aide in the conquest of Europe. Most of the time, however, he worked for peace so as to consolidate France’s gains. He succeeded in obtaining peace with Austria in the 1801 Treaty of Luneville and with Britain in the 1802 Treaty of Amiens. He could not stop the renewal of war in 1803. By 1805 he opposed his emperor’s renewed wars against Austria, Prussia, and Russia in 1805 -1806; he resigned as foreign minister in August 1807 but Napoleon still trusted him. Talleyrand connived to undermine Napoleon’s plans and secretly dealt with Tsar Alexander of Russia and the Austrian minister Metternich. He was seeking a negotiated secure peace so as to perpetuate the gains of the French Revolution. But Napoleon rejected peace and when he fell in 1814, Talleyrand took charge of the Bourbon restoration based on the principle of legitimacy. He played a major role at the Congress of Vienna in 1814-1815, where he negotiated a favourable settlement for France while undoing Napoleon’s conquests. Talleyrand polarizes scholarly opinion. Some regard him as one of the most versatile, skilled and influential diplomats in European history, and some believe that he was a traitor, betraying in turn, the Ancien Régime, the French Revolution, Napoleon, and the Restoration. 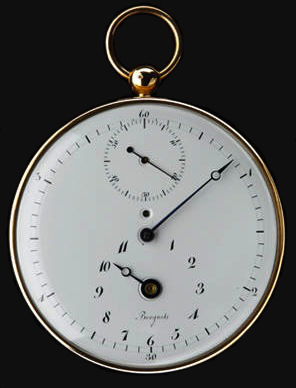 Talleyrand was one of the best customers of Abraham – Louis Breguet, buying from him over 30 watches for himself and his influential entourage. One legend states, that Breguet introduced his newly invented ‘parachute’ shock protection during festivities at Talleyrand’s villa. 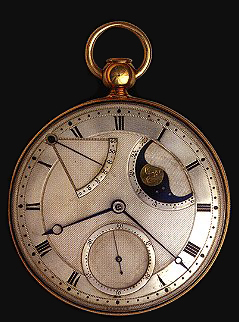 Breguet took his watch out of his pocket and pretended to make it drop on the floor by accident. 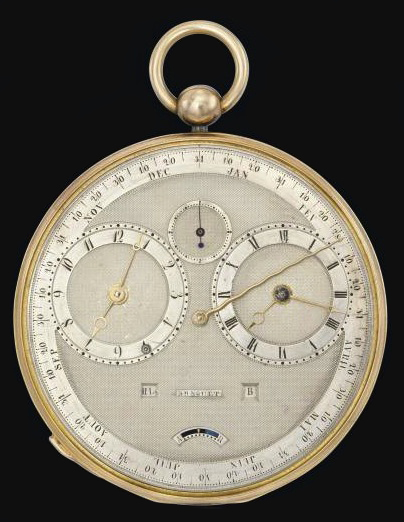 The audience around him was astonished that the watch still worked, which allowed Breguet to explain and market his new invention among the present wealthy aristocrats. 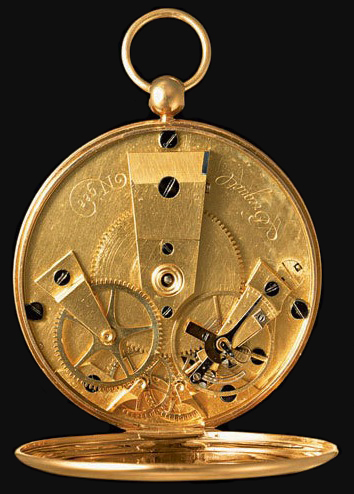 Talleyrand apparently stated ‘Breguet that devil, this can only come from him’. This letter is from his friend and client, then director of the law school in Paris, who invited Lépine to visit him at home to discuss a very important matter (not mentioned). In the letter he argues that Lépine did not accept his invitation and he expresses his disappointment about this reminding Lépine that ‘the matter’ is very important. There are handwritten annotations in black ink on the letter which are attributed to Lépine himself. They show the calculations for a service or an order made and some sort of description which has not been deciphered yet. 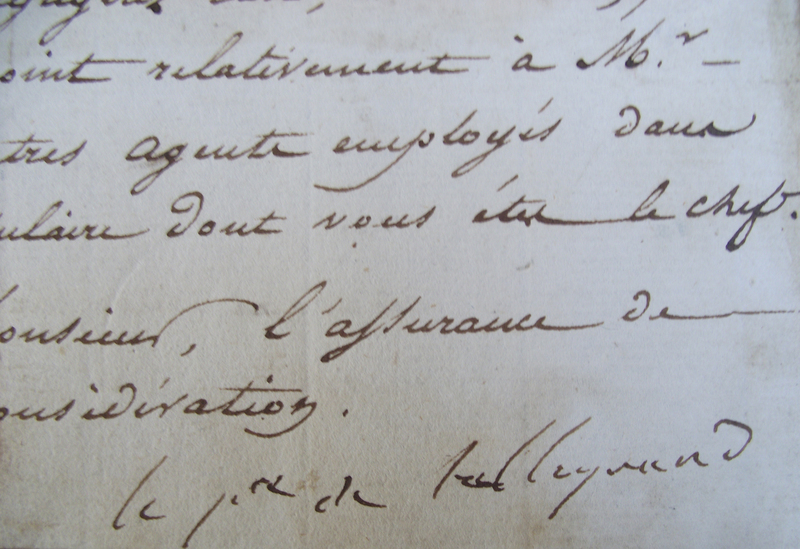 Hand written documents connected with Jean – Antoine Lépine are extremely rare. There are barely images showing this watchmaker and during his lifetime and he did leave very few annotations about his work. When receiving this letter Lépine was already quite old, but still head of his workshop, he died in 1814 aged 93.